Anomalies and developmental variations of organs and anatomical structures are always at special attention since they often have clinical significance and at the same time may present a clinical challenge. The double suprascapular foramen is considered to be a rare variation of development and there were only few cases described in the literature. It also was proposed as a possible cause of suprascapular nerve entrapment syndrome. We present a case of double suprascapular foramen in a male cadaver with a review of its importance and probable cause. Covanțev S, Belic O, Mazuruc N. Double suprascapular foramen: a rare scapular notch variation. Russian Open Medical Journal 2016; 5: e0306. Anomalies and variations of development have special clinical importance and sometimes can be overlooked or misdiagnosed by medical specialists. The suprascapular notch (SSN) is the site where the suprascapular nerve (SN) and the suprascapular vein, traverses the upper border of the scapulae under the superior transverse scapular ligament (STSL). This region is considered to be the most common location of suprascapular nerve injury and compression . type V – U-shaped notch with partial ossification of medial part of suprascapular ligament (10%). Some of these types of anatomical variations can predispose people to suprascapular nerve trauma. The suprascapular foramen can be classified in band and fan-shaped based on its form. The clinical significance is that the band-shaped type is more common and reduces the space below the ligament to a significantly greater degree . One of the studies performed on 610 shoulder in Polish population showed only 32 cases of suprascapular foramen and only one case of double suprascapular foramen using computed tomography (CT) scans . Taking in consideration that double suprascapular foramen is extremely rare there were only few cases described in the literature [4-6]. During a routine bone examination we observed that the right scapula of a 65 years old male cadaver presented a superior border without a suprascapular notch and with two foramena in its place. The length of the superior border, from the base of the coracoid process to the medial angle, was 6.5 cm; the length of the medial border, from the medial angle to the inferior angle, was 17.5. cm; while the lateral border, from the infraglenoid tubercle to the inferior angle of the scapula, was 15.2 cm. The width was 10.2 cm and 5.8 cm in the superior third and the inferior third, respectively. The suprascapular notch was absent and instead two foramena are present each about 4*7 mm in diameter (Figures 1 and 3). There were no other anomalies of the scapula (Figures 1-3). Figure 1. 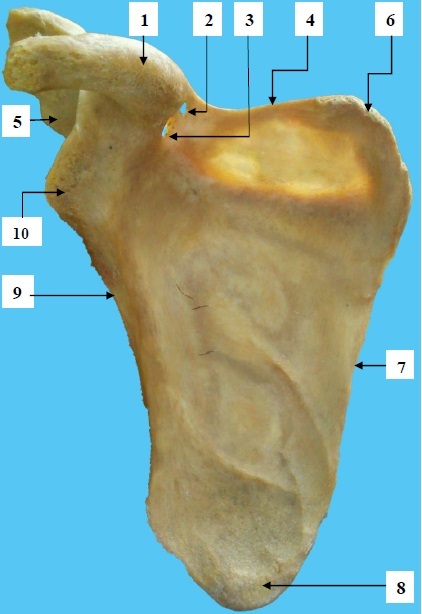 Anterior surface of the scapula: 1 – coracoid process; 2 and 3 – scapula foramen; 4 – superior border; 5 – acromion; 6 – superior angle; 7 – medial border; 8 – inferior angle; 9 – lateral border; 10 – glenoid cavity. Figure 2. 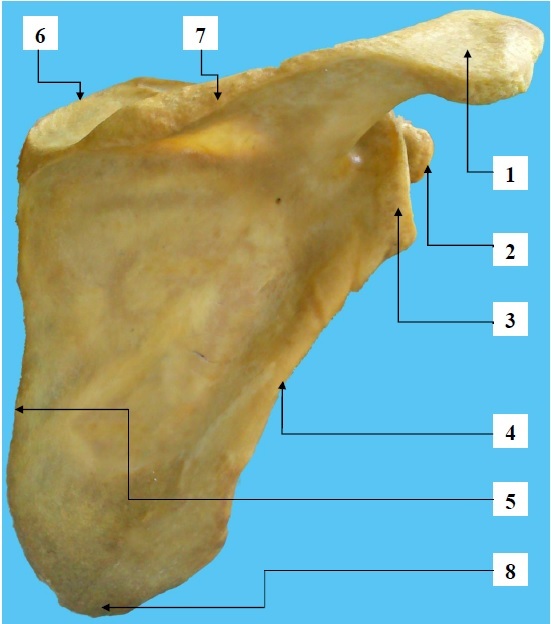 Posterior surface of the scapula: 1 – acromion; 2 – coracoid process; 3 – glenoid cavity; 4 – lateral border; 5 - medial border; 6 – superior border; 7 – spine of scapula; 8 – inferior angle. Figure 3. Anterior surface of the scapula (enlarged): 1 – coracoid process; 2 and 3 – scapula foramen; 4 – superior border; 5 – superior angle; 6 – acromion; 7 – glenoid cavity. Suprascapular neuropathy causes shoulder pain and weakness and can be frequently overlooked by medical specialists. This condition was described for the first time by Kopell and Thompson in 1953 . Since then it became an increasingly recognized condition with every year by medical specialists. Structures that surround this nerve can cause its compression and damage. One of the predisposing factors of this neuropathy is an ossified STSL . STSL in approximately 3.1 % of cases can be bifid and have variations of development . Avery and colleagues in 2002 described that 60% (of 27 cadavers) demonstrated a ligament located on the anterior aspect of the suprascapular foramen and was named the anterior coracoscapular ligament (ACSL). In 41% of cases it was present bilaterally and was associated with a substantially narrowing the suprascapular foramen . The calcification of the bifid anterior coracoscapular ligament. Our case of double foramen is probably caused by ossification of the superior transverse scapular ligament and the anterior coracoscapular ligament. A double suprascapular foramen is a rare developmental variation which should be kept in mind while diagnosing and treating suprascapular nerve entrapment syndrome. Knowledge about existence of the double suprascapular foramen can be useful for surgeons who perform decompression for suprascapular nerve entrapment, neurologists and other specialists who have patients with pain and weakness in the shoulder region. 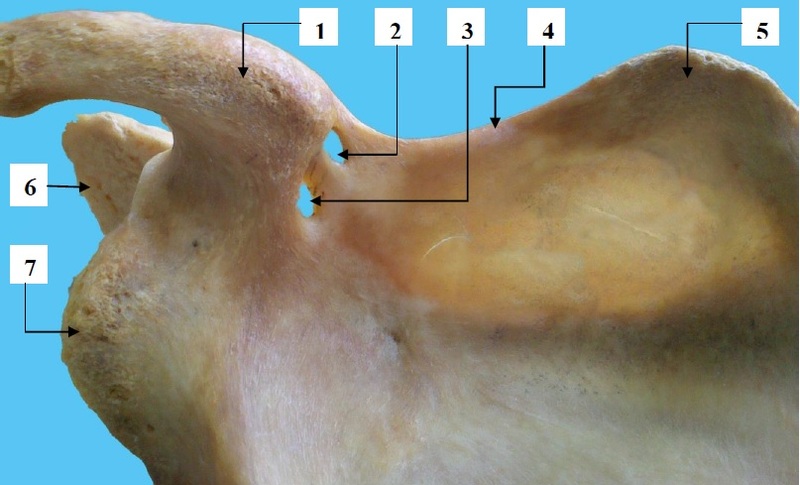 Kannan U, Kannan NS, Anbalagan J, Rao S. Morphometric study of suprascapular notch in Indian dry scapulae with specific reference to the incidence of completely ossified superior transverse scapular ligament. J Clin Diagn Res 2014; 8(3): 7-10. (doi: 10.7860/JCDR/2014/7836.4089) (PMID: 24783065). Polguj M, Sibinski M, Grzegorzewski A, Waszczykowski M, Majos A, Topol M. Morphological and radiological study of ossified superior transverse scapular ligament as potential risk factor of suprascapular nerve entrapment. Biomed Res Int 2014; 2014: 613601. (doi: 10.1155/2014/613601) (PMID: 24804224). Joy P, Sinha MB, Satapathy BC. The ossified bifid superior transverse scapular ligament causing a double suprascapular foramen: a case report. J Clin Diagn Res 2015; 9(6): 1. (doi: 10.7860/JCDR/2015/12812.6037) (PMID: 26266109). Kopell HP, Thompson WA. Pain and the frozen shoulder. Surg Gynecol Obstet 1959; 109(1): 92-96. (PMID: 13668845). Bayramoglu A, Demiryurek D, Tuccar E, Erbil M, Aldur MM, Tetik O, Doral MN. Variations in anatomy at the suprascapular notch possibly causing suprascapular nerve entrapment: an anatomical study. Knee Surg Sports Traumatol Arthrosc 2003; 11(6): 393-398. (doi: 10.1007/s00167-003-0378-3) (PMID: 12830371). Serghei Covanțev – Specialist, State University of Medicine and Pharmacy “Nicolae Testemițanu”, Chisinau, Republic of Moldova. Olga Belic – MD, PhD, Associate Professor, Department of Human Anatomy, State University of Medicine and Pharmacy “Nicolae Testemițanu”, Chisinau, Republic of Moldova. Natalia Mazuruc – Specialist, State University of Medicine and Pharmacy “Nicolae Testemițanu”, Chisinau, Republic of Moldova. © 2016, Covanțev S., Belic O., Mazuruc N.